A Kuok family company has sold a piece of prime land in the Kuala Lumpur City Centre for some RM150 million, making it the family's second land sale in the past six months. Sources told Business Times that a piece of land measuring 0.65ha on Jalan Perak next to Wisma Hong Leong was sold for RM2,200 per sq ft. It is understood that the land is currently being managed as a carpark. The land is said to belong to Wisma Perak Sdn Bhd. A search with the Companies Commission revealed that Wisma Perak is equally owned by FFM Bhd and Kuok Brothers Sdn Bhd. FFM Bhd is wholly owned by agri-business giant PPB Group Bhd. One source said the land has been sold to a local individual. The land also has a development order for a twin tower structure comprising offices and serviced apartments. The land has two frontages, Jalan Kia Peng and Changkat Kia Peng, and was sold for about RM2,000 per sq ft. The owners of the land are said to be related to Malaysia's richest man, Tan Sri Robert Kuok. This land will be developed into a single tower of high-end residences with a net sellable area of 212,650 sq ft. The project is expected to have a gross development value of RM272 million and provide a gross margin of some RM58 million. AFTER five decades in limbo, attempts to redevelop Kampung Baru may soon become a reality as the Cabinet has agreed to the concept and redevelopment plans put forward by the Federal Territories and Urban Wellbeing Ministry. Its minister, Datuk Raja Nong Chik Raja Zainal Abidin, said even though the Cabinet had given the green light, nothing has been finalised yet as the ministry would have to meet the stakeholders, including residents and landowners at the end of the month. He also said he would be meeting the government-linked companies (GLCs) that would be involved in the redevelopment plans. 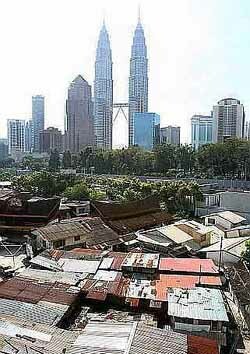 “There are three components to the redevelopment plans — one of it is that the Cabinet has agreed that Kampung Baru will be developed comprehensively — in totality. No areas will be left out — in other words all landowners will get the same deal. “Secondly, we will set up a Kg Baru Development Corporation, to be endorsed by Parliament, and thirdly only trustworthy developers from GLCs will be identified for the redevelopment,’’ he said. However, Nong Chik said the monitoring authority would be the Kampung Baru Development Corporation which would ensure that the village’s rustic and Malay identity as well as the people’s interests would be safeguarded. He added that the corporation would come under the FT Ministry’s purview. Nong Chik said the ministry had identified a mechanism to resolve the multiple ownership problem, but added that he was not at liberty to divulge it to the press without speaking to the stakeholders first. “All I can say is we have various mechanisms, but we have to see which one is most agreeable to the landowners. I will present the full picture when I meet them,’’ he said. Nong Chik said Kampung Baru must be developed no matter what and that the place would look like a modern township in par with KLCC one day. “The Malay characteristics will be retained but in a modern sense — it will not look like the pasar malam that it is now. “The whole process of talking to the people, setting up the Corporation and identifying the GLCs will take about six months and once we get these technicalities out of the way — only then we can tackle the legal aspects,’’ he said. Sunway City Bhd (SunCity) continues to fortify its reach and presence in Penang with the launch of Sunway Aspera, a freehold residential development at Sungai Batu. "The estimated gross development value of the project is RM47 million and pricing of units, start from RM495,000 onwards," Suncity said in a statement here today. The development comprises of 76 units of two-storey and nine units of three-storey terrace homes. "At Sunway City, we placed great emphasis on developing homes with lush greenery to provide families with a naturally relaxing and comfortable environment, such as Sunway Bukit Gambier and Sunway Tunas," said Managing Director, Property Development Division, Malaysia Sunway City Bhd, Ho Hon Sang. Apart from Sunway Aspera, SunCity has numerous other exciting projects in Penang, including Sunway Merica and Sunway Prima. PETALING JAYA: Kumpulan Jetson Bhd’s wholly-owned subsidiary Jetson Construction Sdn Bhd (JCSB) has entered into a joint-venture agreement with China State Construction Engineering (Hong Kong) Ltd to form a joint-venture (JV) entity. The company told Bursa Malaysia that the JV would prepare and submit a tender invited by Naza TTDI Sdn Bhd for the proposed development of a 38-storey building with 10 levels of podium for Platinum Park in Kuala Lumpur. JCSB will have a 60% stake in the JV, which is aimed at pooling and sharing resources in technical and management skills, finance and equipment. BEIJING: China is drawing up a new curb on property developers as part of a host of measures to cool the country’s red-hot property market, the state-controlled China Securities Journal reported yesterday. The plan would ban developers from investing revenue from pre-sales of uncompleted property developments in new projects, it said, citing an unnamed source close to the Housing and Urban-Rural Development Ministry.